Most cabinet installation jobs require the use of Filler panels and void spaces. These are normally (but not limited to) between 30mm to 60mm wide and are typically the same colour and finish as the material used for your cabinet drawers or doors. When designing your cabinet solutions, keep in mind that you may need to include Filler panels and void spaces. Fillers and voids are super helpful in combating some of the uncertainties that may arise during installation, from corners of your room not being 90 degrees, or walls not being exactly square – resulting in your finished cabinets either fitting tight, or not at all. In both instances, void spaces and Fillers would help to alleviate the problems that arise and result in a straight, centred and seamless finish to your installation of cabinets. It is crucial when measuring between two walls to measure against the wall at the back where your cabinets will sit, and then another measurement in line with where the front of the cabinets will be positioned. 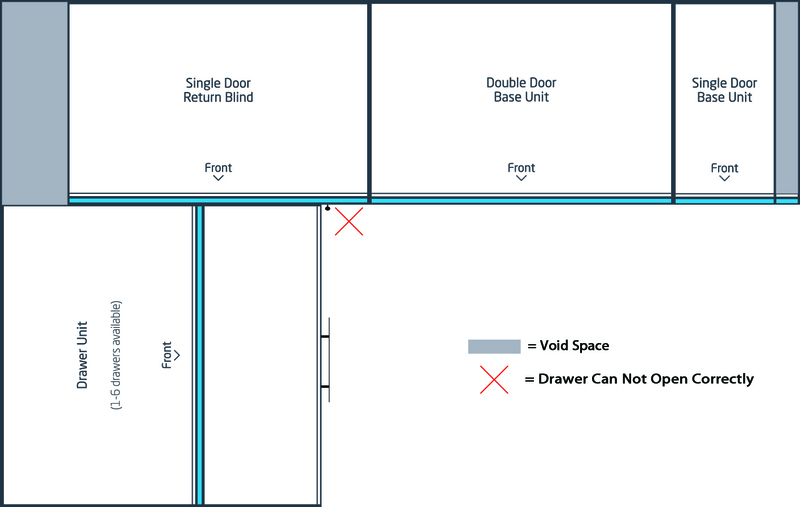 See the above image for an example of when your wall may be out of square and can cause potential problems at the time of cabinet installation. First measurement against the wall at the back is 3020 mm, with the second measurement in line with where the front of the cabinets are to be positioned sits at 3040 mm. You can see the obvious problem that this may cause. When using filler panels, installing your cabinets becomes an easy task. 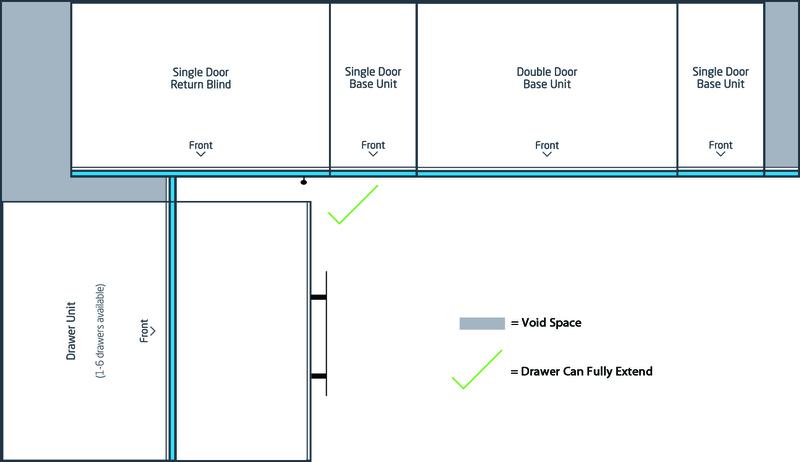 Place your cabinets in position allowing for the void space. This gives you flexibility of cabinet position with the Filler panel covering the front of the empty void space beside your cabinet, giving you that seamless look. See image above. 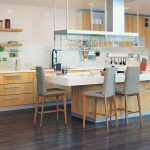 Your dream kitchen may come in the form of a U-Shape, meaning you have 3 walls to contend with. By placing a Corner L Shape cabinet that has a smaller depth than your other base cabinets in the corners of your room, ensures that you have plenty of wiggle room behind to ensure your cabinets fit in your available space. See the layout above – by making your Corner L Shape cabinets have a smaller depth than the rest of the cabinets, it creates a void space behind to hide any variation the two corner walls may have. Including the allowance for a void space ensures that your kitchen will hold a straight line from one end of your kitchen to the other. The beauty of void spaces is that once your bench top is installed, they will be completely hidden and even you will likely forget they are there. As with the Straight Line Kitchen example, make sure if measuring between two walls that you take two measurements – one at the back of the wall, and one near where the front of your cabinets will be positioned to ensure accurate measurement of your room and work space. 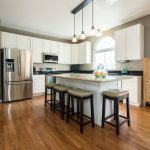 If your dream kitchen falls into this category, you will only have one corner to be cautious of. As with a U-Shape Kitchen, using a Corner L Shape cabinet with a depth slightly smaller than your other cabinets will allow for a void space to be present. See the above layout where we have used a Corner L Shape cabinet with a void space behind it, as well as a filler panel on the right end of the kitchen to finish the run of cabinets against the wall. By making use of two void spaces either side of your cabinet run gives you ample room to correct any inaccurate walls you may have. Blind Return cabinets can also be used in the corner of a room where a Corner L Shape cabinet either cannot be used or if you have a preference for a different style of cabinet. Here, a filler panel is used between the Returned Blind Upper cabinet and the Single Door Upper cabinet, hiding any void space between the two cabinets and giving ample room to line up remaining cabinets. When used with a Return Blind cabinet, a Filler Panel gives your door more room to open so it’s not opening into your other cabinets. See above layout of upper cabinets with a Filler Panel and Return Blind cabinet used. The Single Door Upper cabinet has no restriction of door movement because of the extra space provided by the Filler panel and void space, ensuring you have full access to the upper cabinet. Using a Filler panel on a Return Blind cabinet also gives you the ability to use Drawer cabinets near corners without having to worrying about the drawers hitting on the adjacent cabinets handle. In the first example below, the drawers on the Base Cabinet cannot fully extend without hitting the door handle of the Single Door Return Blind cabinet. In the second example below, a Filler panel with void space has been successfully implemented allowing for the drawer to fully extend and give maximum access to drawer space.